Google Play Games is an online gaming service and software development kit operated by Google for the Android operating system. It features gamer profiles, cloud saves, social and public leaderboards, achievements, and real-time multiplayer gaming capabilities.The Play Games service allows developers to incorporate the above features into their games without having to develop those features from scratch themselves. The Google Play Games service was introduced at the Google I/O 2013 Developer Conference, and the standalone Google Play Games mobile app was launched for Android on July 24, 2013. Andrew Webster of The Verge compared Google Play Games to Game Center, a similar gaming network for users of Apple Inc.'s own iOS operating system. 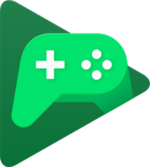 Google Play Games has received updates over the years since its launch, including a screen-recording feature, custom gamer IDs, built-in games, and an arcade for game discovery. ^ "Google Play Games". APKMirror. Android Police. Retrieved March 4, 2019. ^ "Google Play Games (Android TV)". APKMirror. Android Police. Retrieved March 4, 2019. ^ Hartrell, Greg (March 17, 2014). "Unlocking the Power of Google for Your Games, at GDC". Android Developers Blog. Google. Retrieved January 18, 2017. ^ a b Webster, Andrew (May 15, 2013). "Google announces Play game services, Android's cross-platform answer to Game Center". The Verge. Vox Media. Retrieved January 18, 2017. ^ Ingraham, Nathan (July 24, 2013). "Google takes on Game Center with Google Play Games for Android". The Verge. Vox Media. Retrieved January 18, 2017. ^ Curtis, Duncan (October 28, 2015). "Google Play Games: capture and share the moment". Official Android Blog. Google. Retrieved January 18, 2017. ^ Frenkel, Benjamin (February 18, 2016). "Embrace your inner gaming hero with Gamer ID". The Keyword Google Blog. Google. Retrieved January 18, 2017.